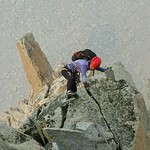 Goode climb and Goode partner! 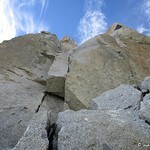 The North Buttress of Mt. Goode is a classic High Sierra route. 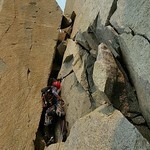 The climb takes an aesthetic line up a dramatic 800' buttress, with sustained 5th class climbing up to 5.9. Plus, the climb has a beautiful setting and a relatively straight-forward approach and descent which makes it a great car-to-car climb. 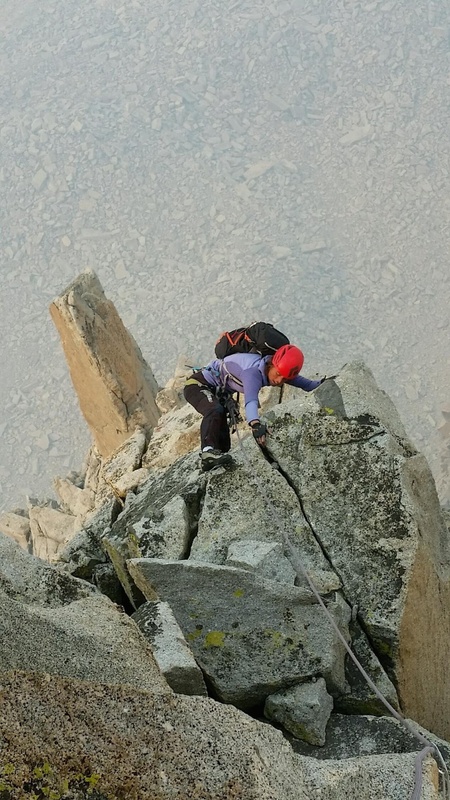 I first became aware of this climb when paging through my High Sierra guidebook. 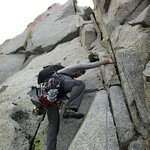 In my home territory of the North Cascades, one of our classic climbs is the NE Buttress of Mt. 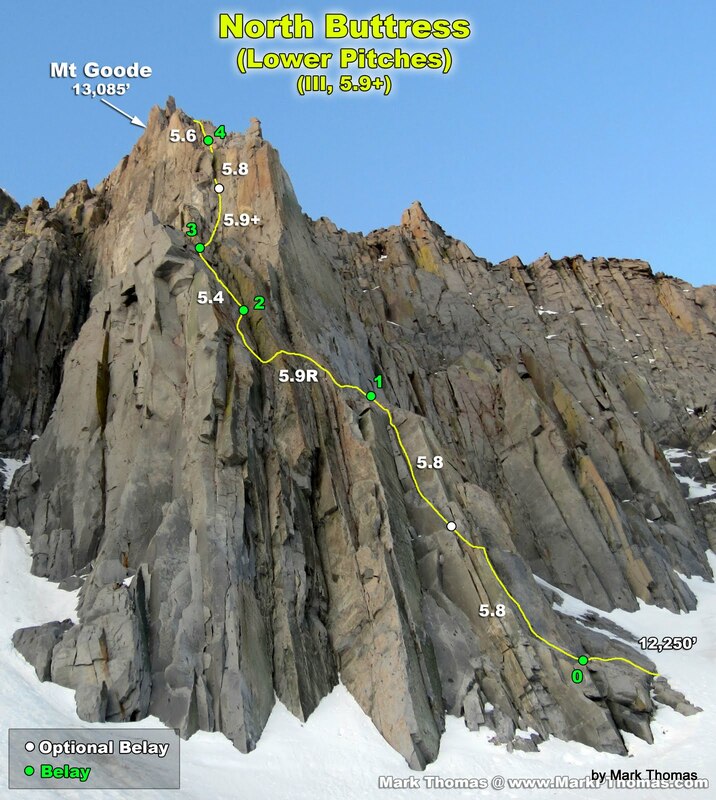 Goode (click link for trip report). 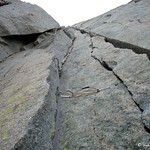 So, naturally, my attention was piqued when I noticed there was a classic buttress route up a Mt. 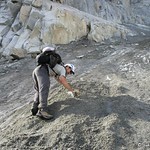 Goode in the Sierra as well. 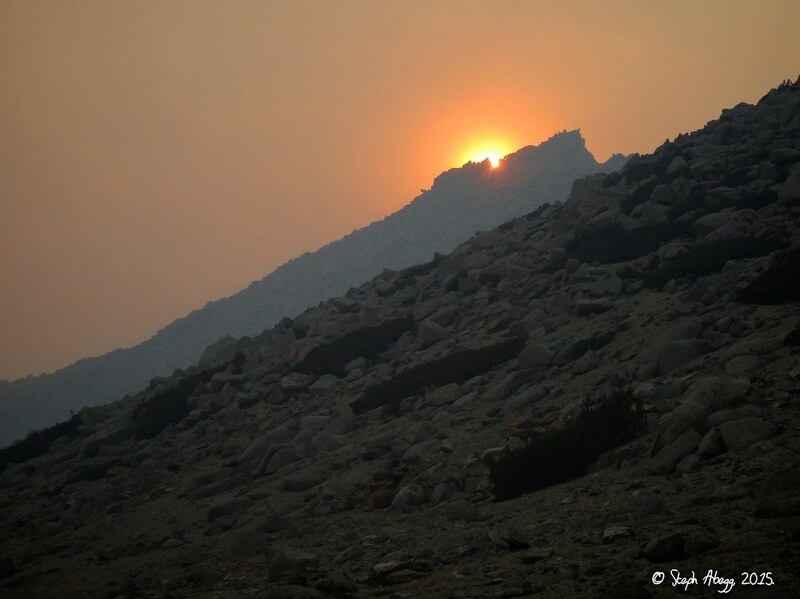 In August 2015, I finally got the opportunity to climb the Sierra's Mt. Goode. 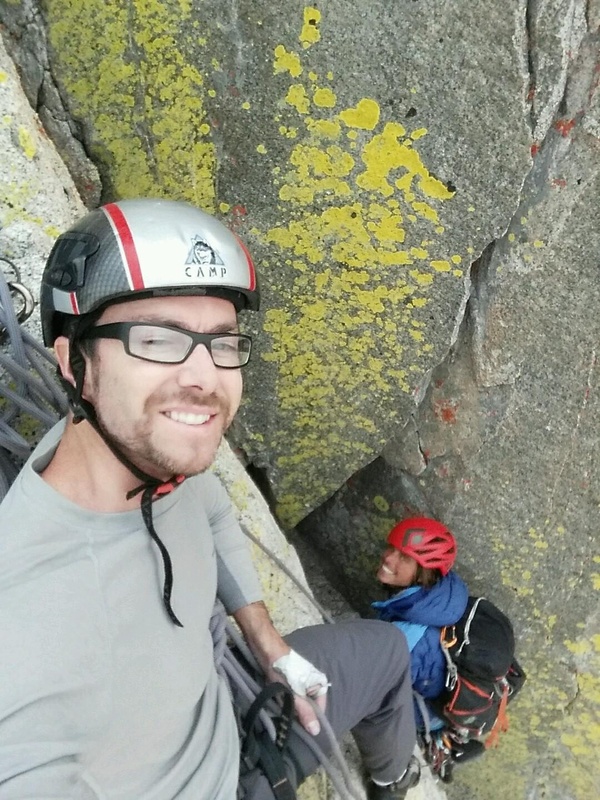 I climbed it with Nathan Petrosian, a friend of a friend who turned out to be a really nice guy and super solid climbing partner. 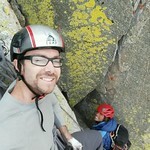 Nathan and I enjoyed this climb, finding it to be fun and athletic in nature. 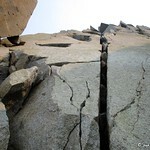 The crux of the day was definitely the ~100' band of bullet-hard dirty ice guarding the base of the route. 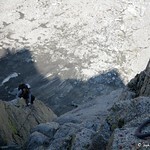 After this, it was just a lot of goode alpine climbing with goode position. 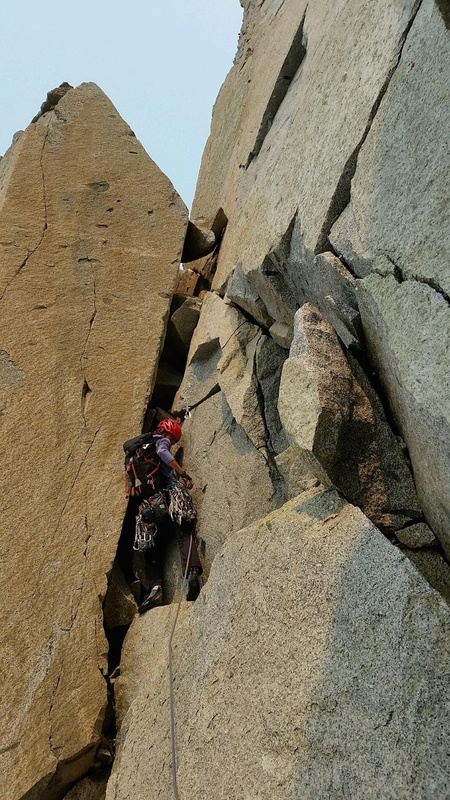 We climbed the 800 ' route as 7 pitches (linking SuperTopo Pitches 1&2 and 5&6 with a 60m rope) and coordinated leads so that we each got a crux pitch—I led Pitch 3 with the 5.9 traverse and Nathan led Pitch 5 with the sustained 5.9 corner. The approach took about 3 hours, the snowfield took at least 1 hour, the climb (from the time we started up Pitch 1 to the time we arrived on the summit) took 6 hours, and the descent took about 3 hours. Our headlights stayed in our packs. 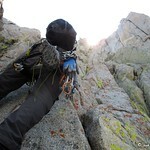 The following page gives some route overlays and photos from the climb. Thanks Nathan for a goode day! Route overlays by my friend and King-of-the-Route-Overlay Mark Thomas. Mark's trip report for Goode. He notes: "Pitches are according to the SuperTopo Topos, where I linked pitches 1 & 2, 5 & 6. 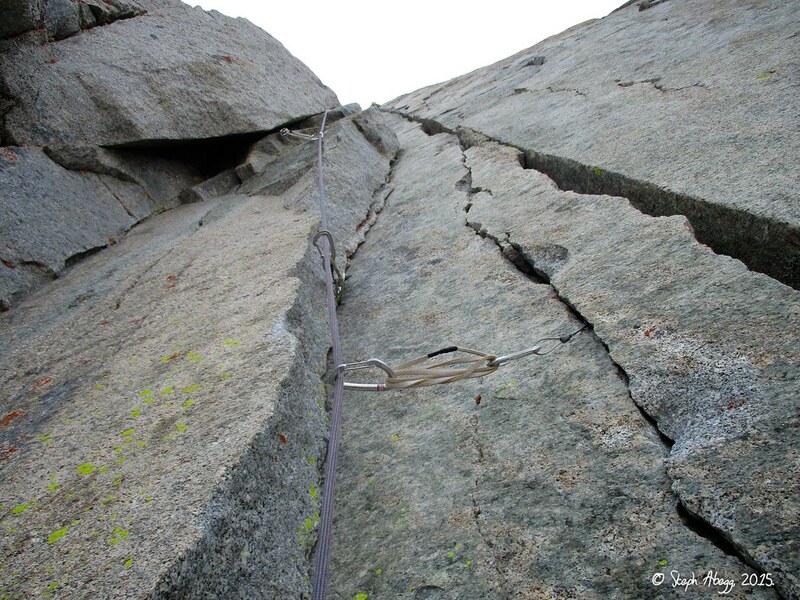 Optional belays are the other SuperTopo belays." The route as seen from the final approach. The first half of the route as seen from closer to the buttress. The approach is about 5 miles (3.5 miles on trail, 1.5 miles cross country). 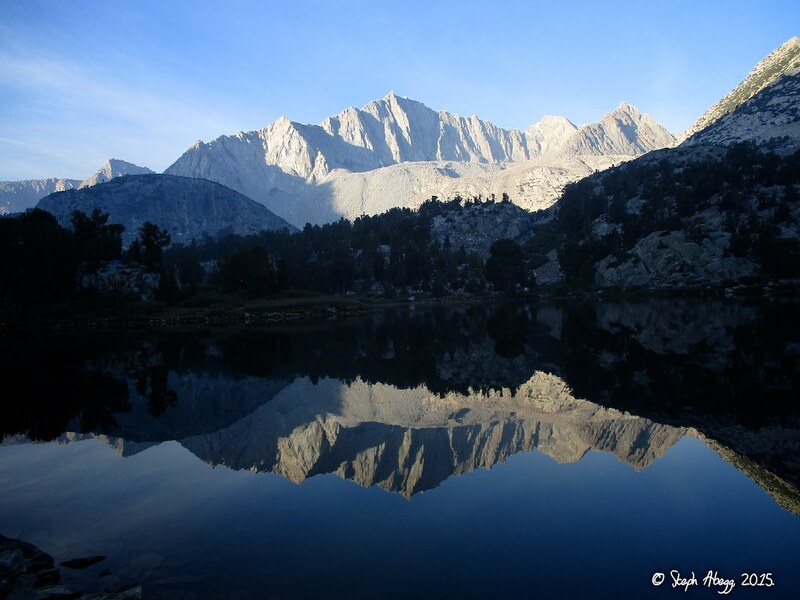 Start at the South Lake Trailhead (accessed from HWY 168 out of Bishop), leave the trail at the south shore of Long Lake and hike cross-country to the base of North Buttress. 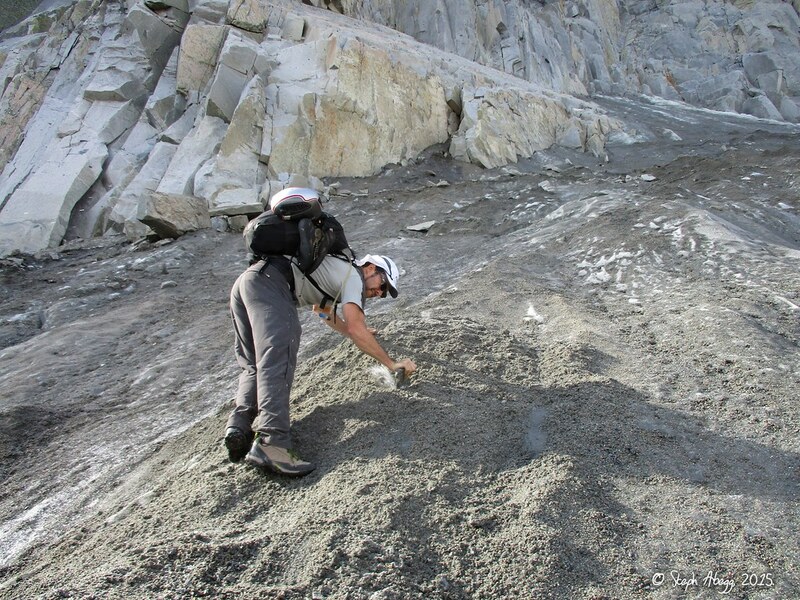 Final access to the route is barred by a snowfield (of varying difficulty depending on the time of year, day, etc.). 1. 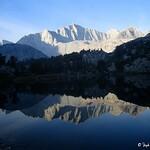 Reflection of Mt. Goode in Long Lake. About 1.5 miles of cross-country from here to the base of the route. 2. 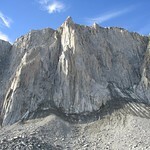 North Buttress of Mt. Goode. 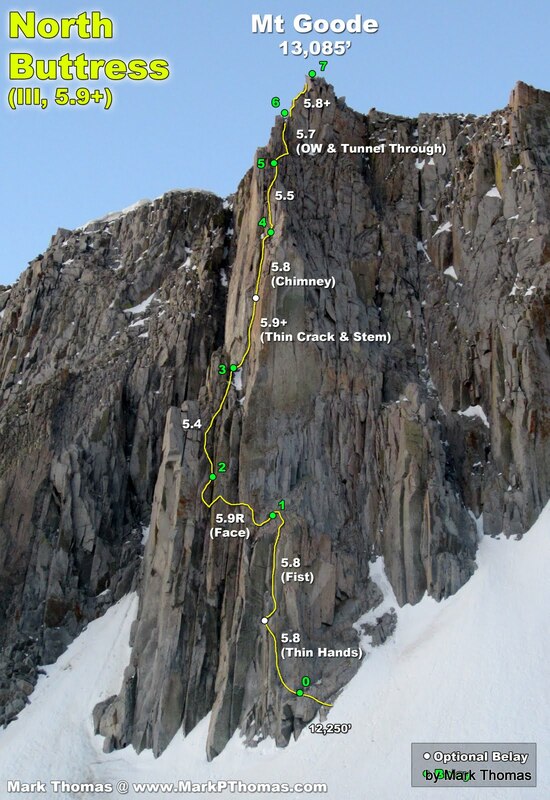 There are several 4th-5th class options to the base of Pitch 1, depending on where you access the rock, dictated by the snowfield. 5. Looking up from where we accessed the rock off the ice. The lower part was dirty 5.9ish and above that a bit easier 5th class. 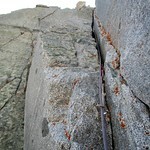 It was less than a full rope length from here to the base of Pitch 1. 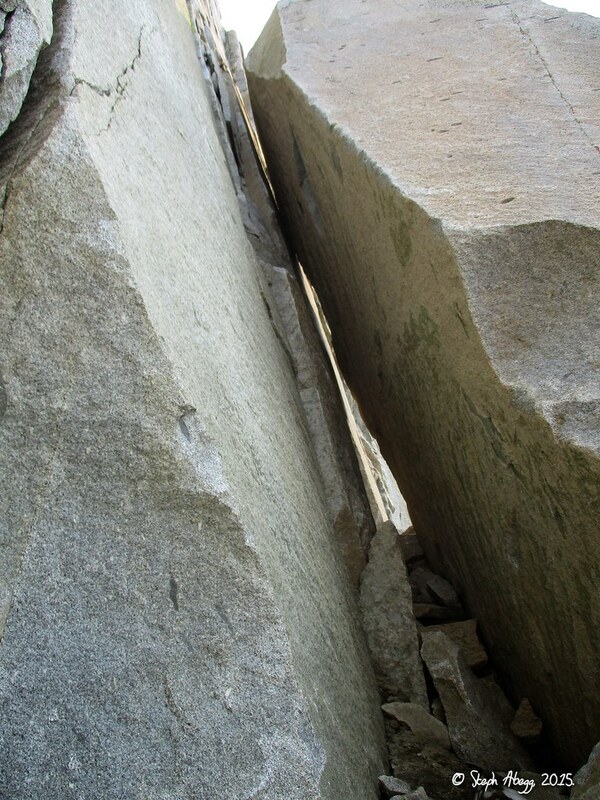 Climb the open book with a thin-hands crack on the left side. Ends at a ledge. 6. Nathan starting up Pitch 1. 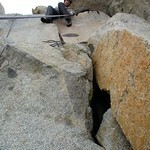 Because we set our belay right at the base of this crack, we linked Pitch 1 easily with Pitch 2. Another open book with a fist to hand crack in the corner. 7. The aesthetic corner of Pitch 2. 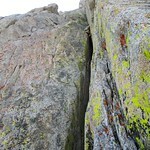 This was one of my favorite pitches on the route. There as a wide section (#4 cam) but it was short and there were enough features alongside the crack to make the climbing more fun than burly. 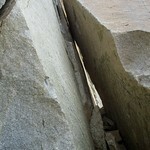 Traverse left across the face, toward an old piton. 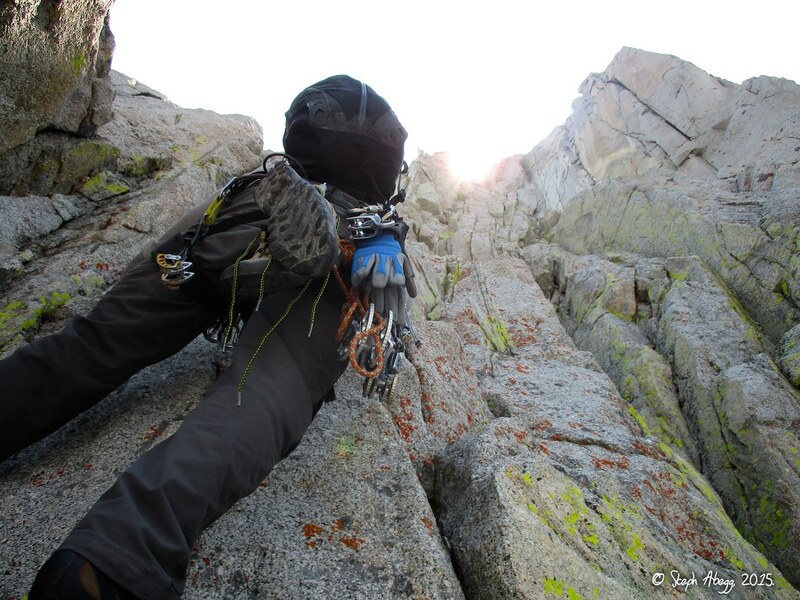 Sparse gear protects the traverse, with the crux move being dropping down across the chimney. 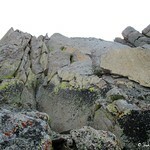 Cross the chimney and climb the face to the left. 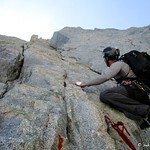 Protect the follower on this pitch and choose a belay location based on rope drag and communication. 8. The start of Pitch 3 as seen from the belay at the top of Pitch 2. You start off by climbing to the obvious flake, then step down and across an arete (the first of two aretes), then traverse toward the piton (the second arete is just after the piton). 9. 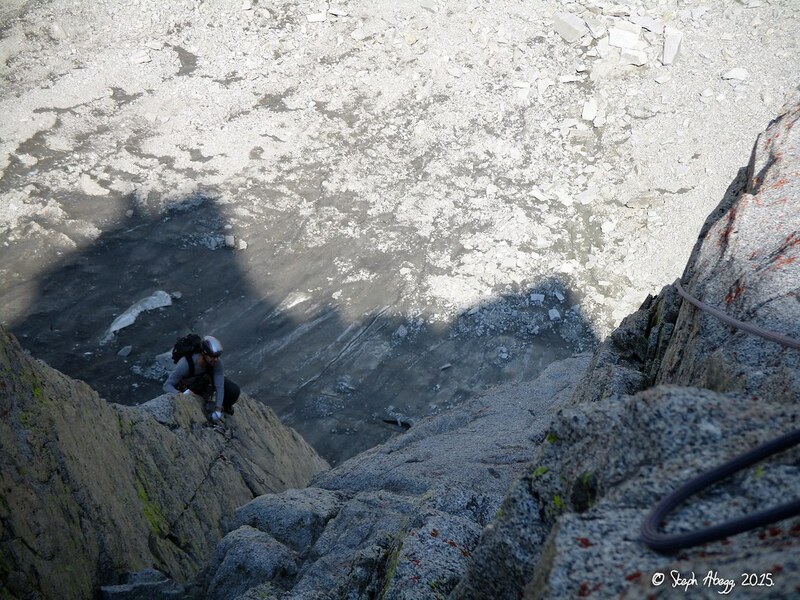 Looking back at Nathan at the belay from my stance on the arete just after the piton. 10. The chimney as seen from the arete just after the piton. 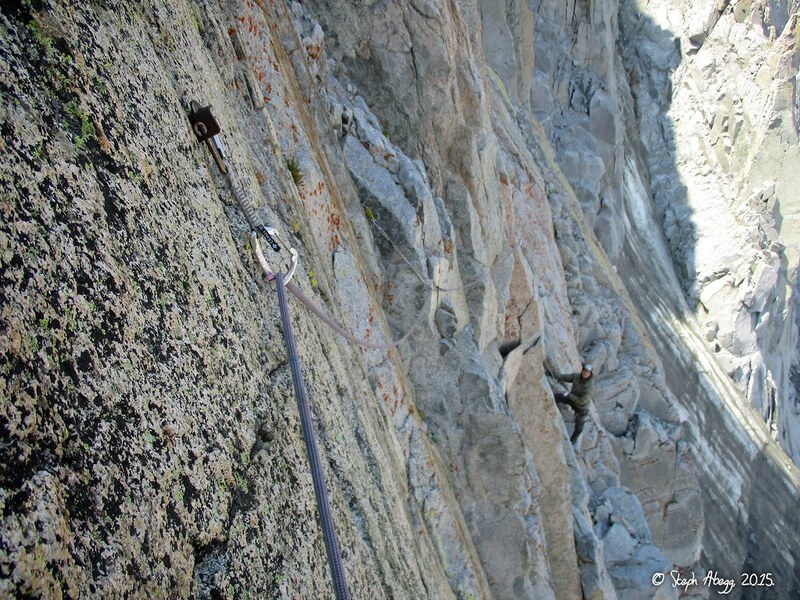 The crux of the pitch is traversing down to the chimney and stepping over it to the face on the other side. It can be protected with thoughtful placements of small cams and nuts. 11. 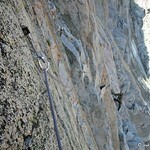 Looking down from the belay at Nathan on the arete just after the pition. 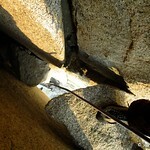 Hint for the follower: make the move to the arete before you unclip the piton, then step up a foot and unclip the piton. 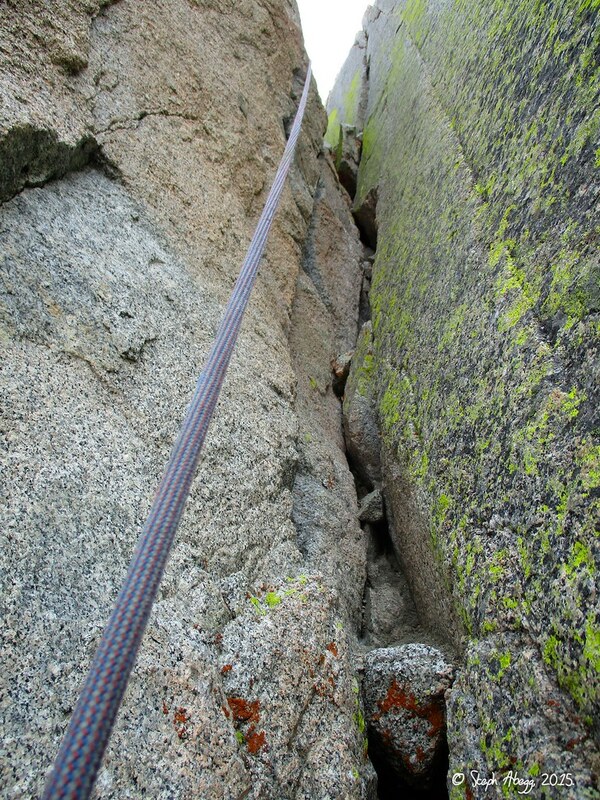 This prevents a potential blind swing if the follower slips while making the move to the arete. 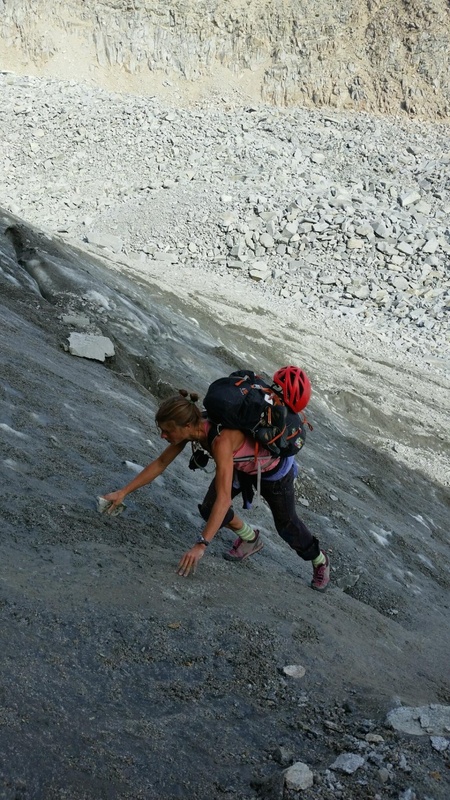 Climb up loose, easy 5th class to the base of the steep corner. 12. Nathan starting up Pitch 4. An unmemorable "get there" pitch. Head straight up the corner stemming and jamming in the finger cracks. There's a tempting (probably harder) finger crack on the face just to the right. 13. Looking up Pitch 5. 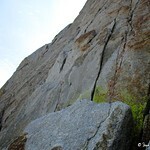 This is the second crux pitch of the route. Since I had led the first crux pitch (Pitch 3) and Nathan still had most of the gear after leading the previous pitch, Nathan led this pitch. He linked it easily with Pitch 6. 14. 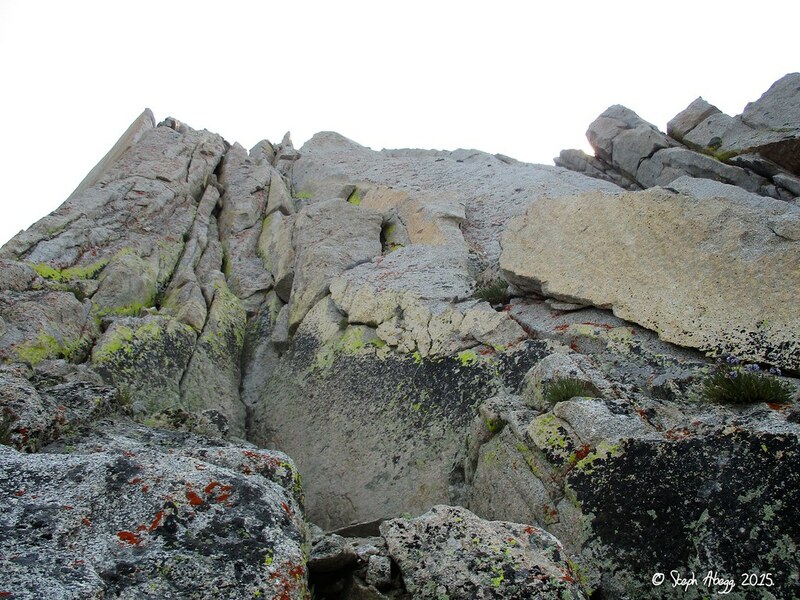 The flaring corner/chimney of Pitch 6, easily linked with Pitch 5. 15. Nathan taking selfies at the belay. It was nice to have a partner also taking photos en route! 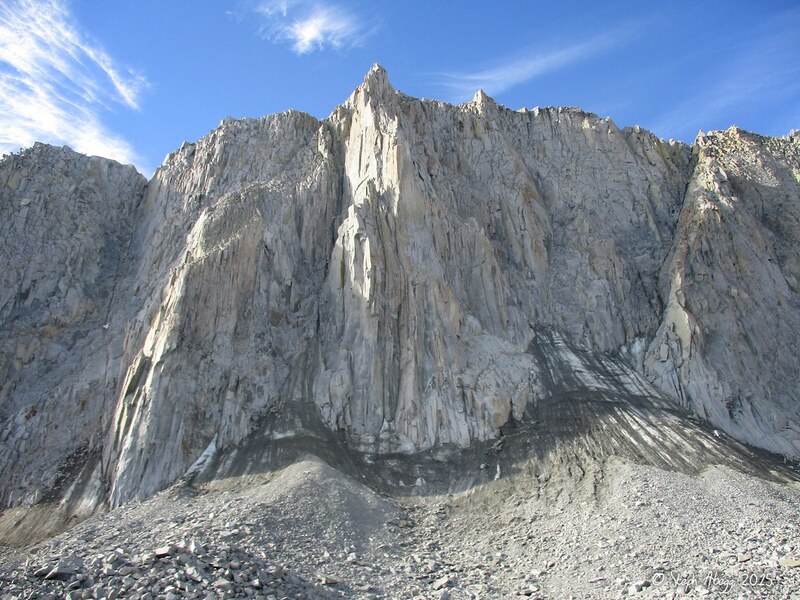 Blocky low 5th class terrain to a large, talus-covered ledge on the west (climbers' right) side of the buttress. 16. 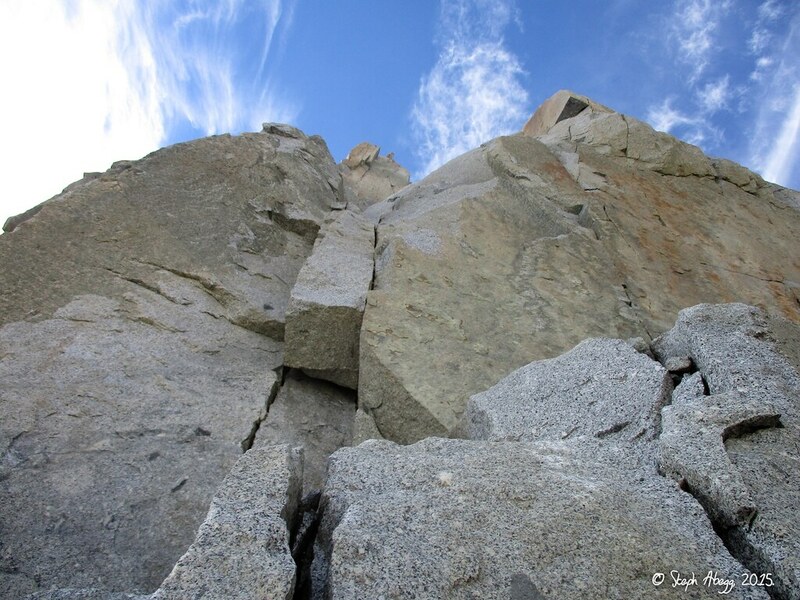 Looking up the blocky terrain of Pitch 7. 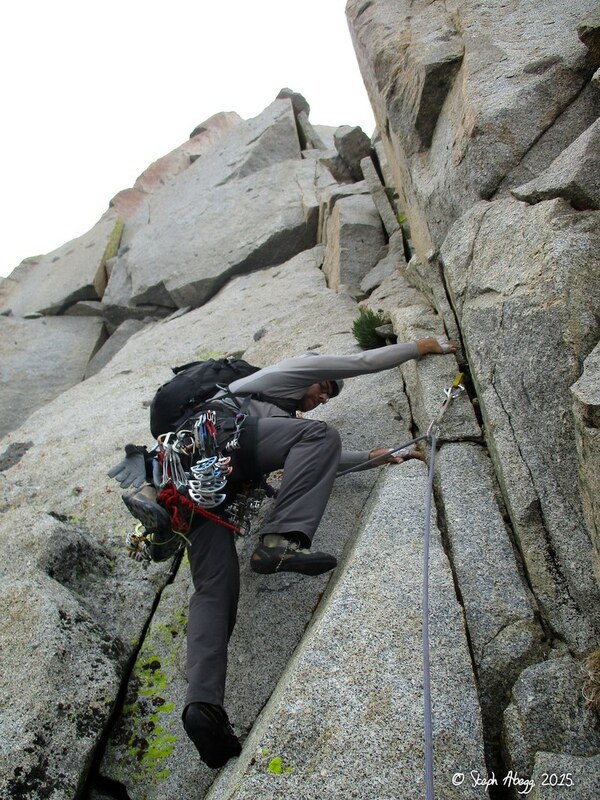 This was a longer pitch than noted on the topo (our 60m did not quite make it to the talus-covered ledge), perhaps because we set the belay at the top of Pitch 6 a bit low. 17. 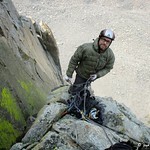 Nathan at the belay as I led off Pitch 7. It is a north-facing route so we did enjoy down jackets at the belays, but it wasn't bitterly cold and lightweight puffies would have been sufficient. 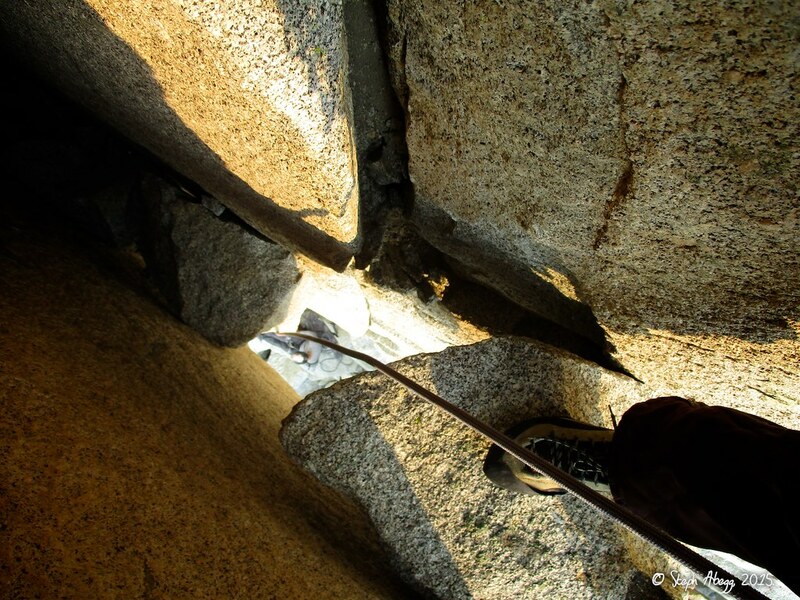 Climb a chimney, tunnel under a large chockstone, and follow a leaning crack to the arete. 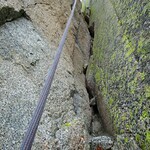 Belay on the east (climbers' left) side of the arete. 18. 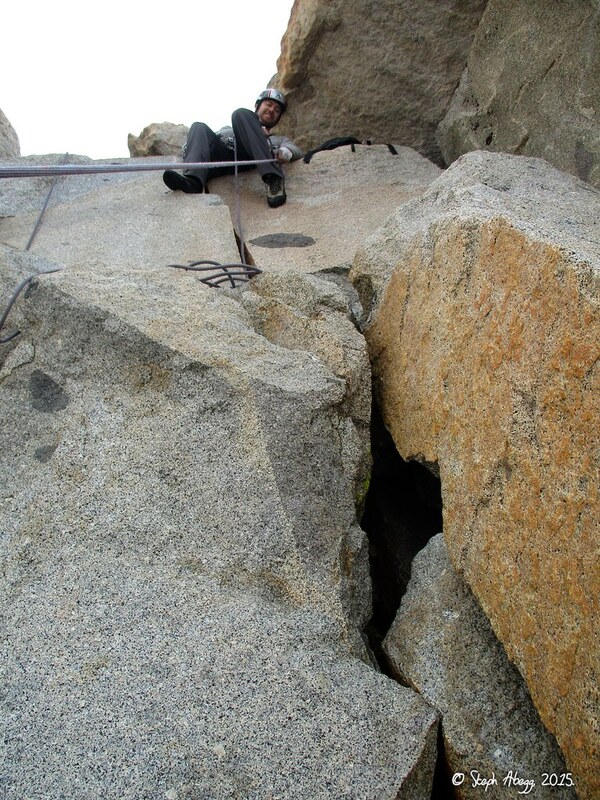 The "huge pillar with chimney behind" on the right side of the talus-covered ledge at the top of Pitch 7. This is NOT the tunnel-through. 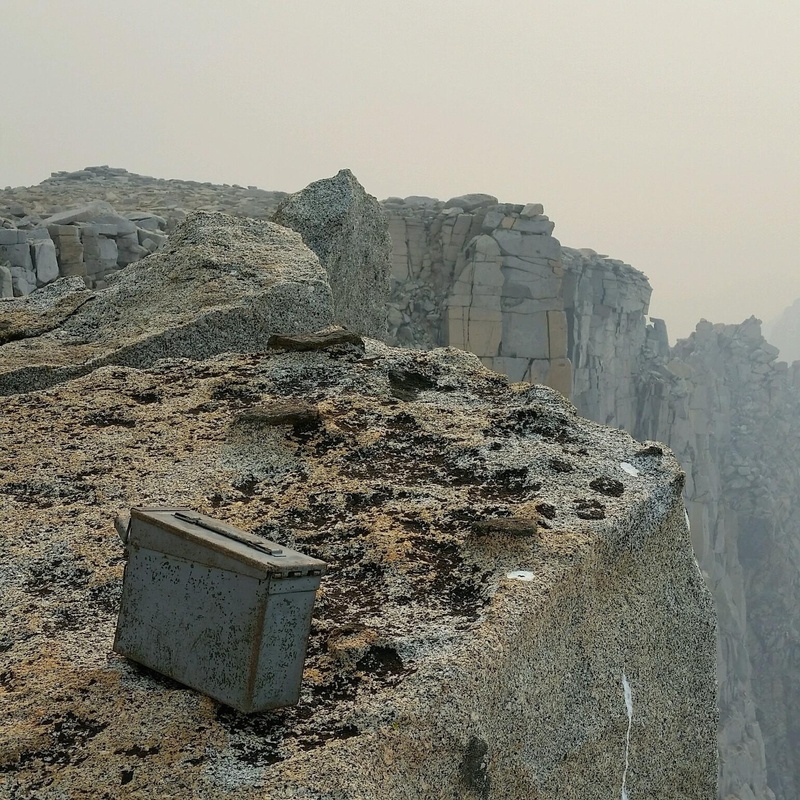 It seems that a lot of parties get off route here or take a route variation, but the Pitch 8 shown in the SuperTopo topo actually climbs a chimney on the left side of the ledge. 19. 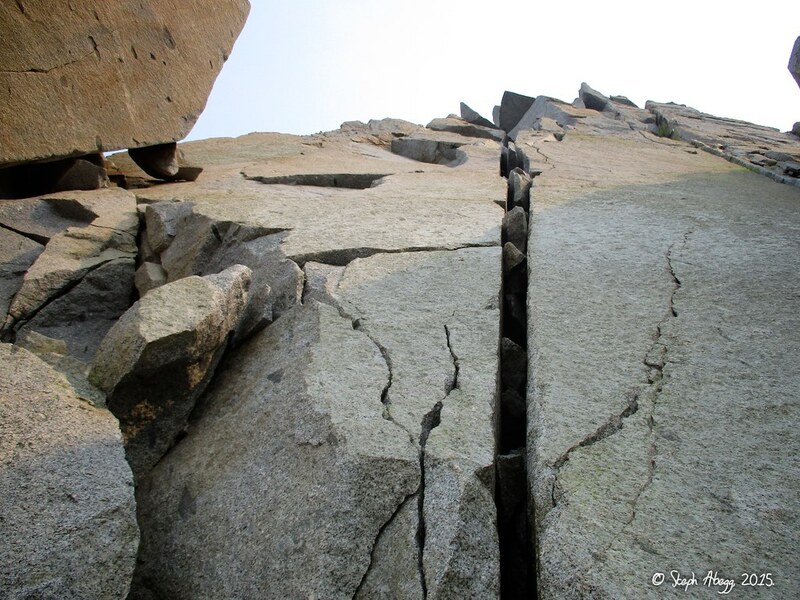 An offwidth crack directly above the talus-covered ledge. 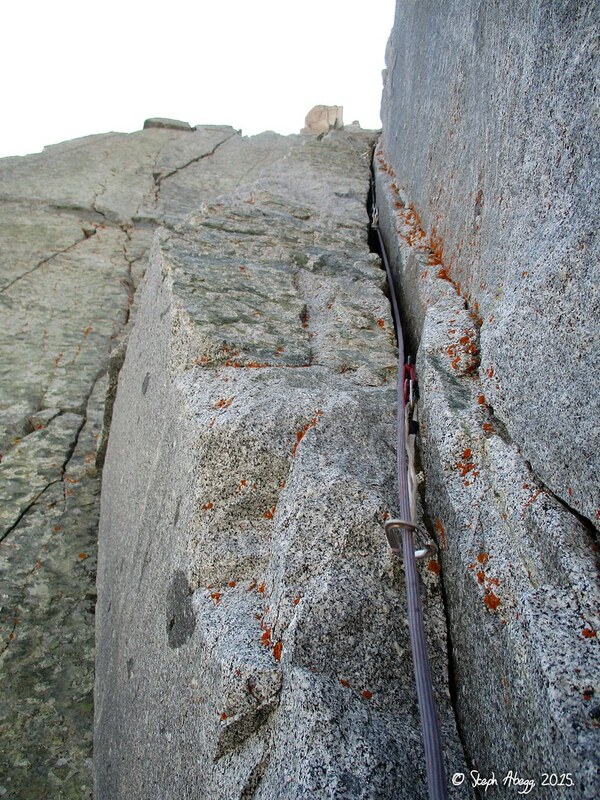 You could climb this as a variation of Pitch 8, but the SuperTopo Pitch 8 climbs a chimney to the left. 20. Steph starting up the chimney of Pitch 8. Photo by Nathan Petrosian. 21. Looking down from just above the tunnel through about 40 feet into the chimney. Other trip reports show different tunnel throughs on this pitch, but I believe this is the one indicated in the SuperTopo topo. Climb up to gain the ridge. 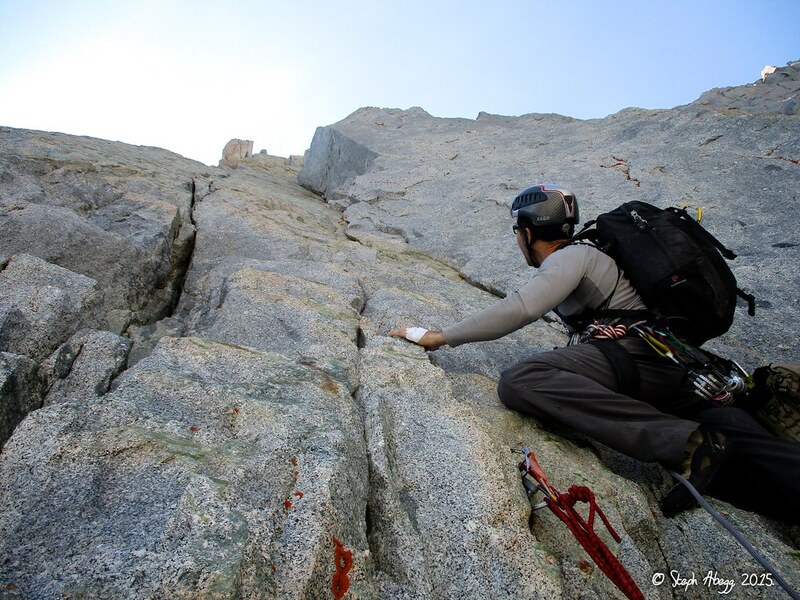 Follow the ridge until just below the summit block, and finish the climb with a short 5.9 boulder problem. 22. 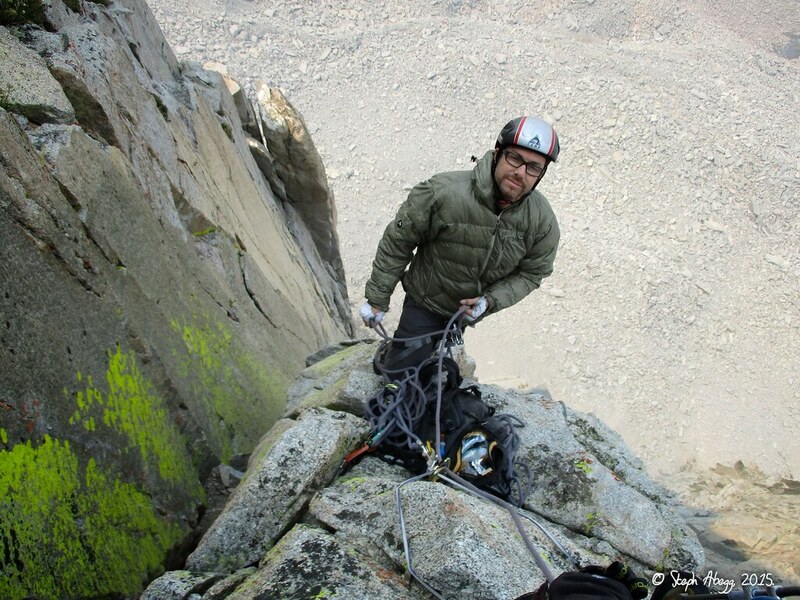 Nathan leading the final pitch to the summit. There are variations of this pitch but we followed the route illustrated in the SuperTopo topo. 23. Steph midway up Pitch 9. 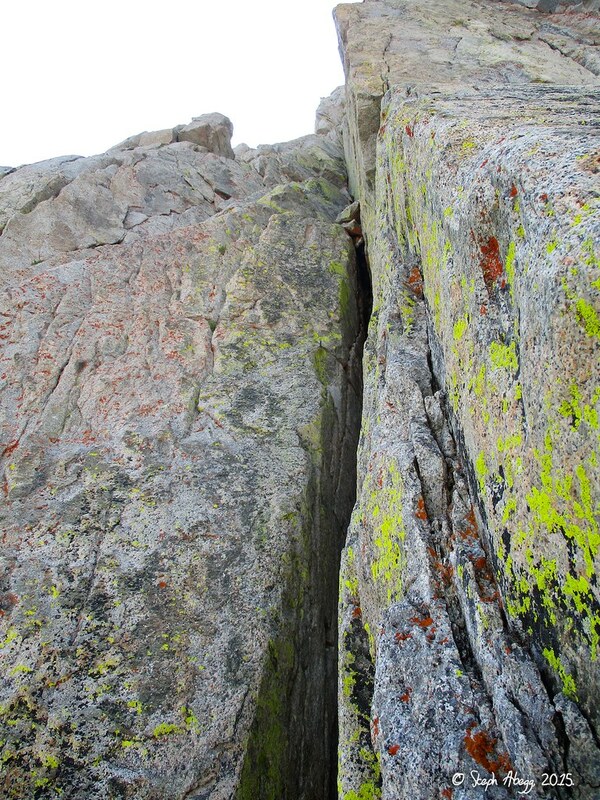 The route finishes with some nice exposure right on the exposed buttress. Photo by Nathan Petrosian. 24. 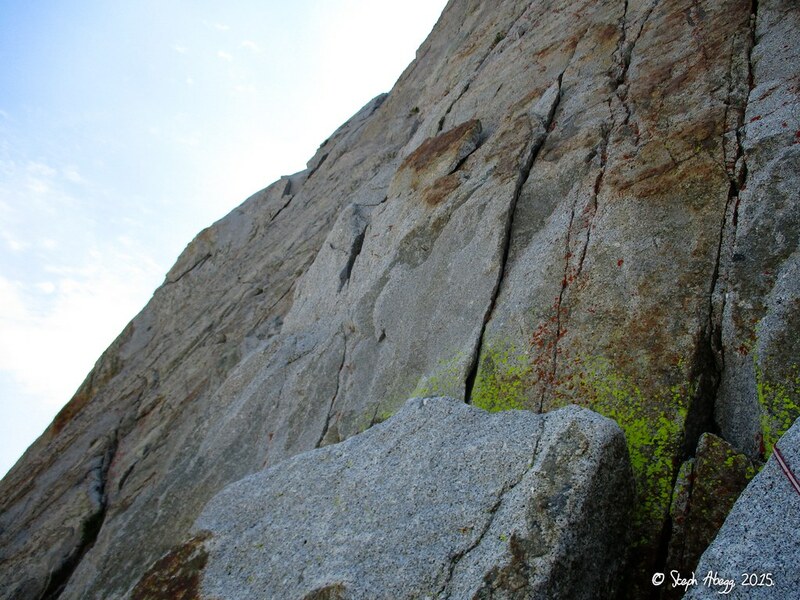 The route ends with a short and fun 5.9 boulder problem. In this photo Nathan is sitting just below the summit. Goode job! 25. 25. 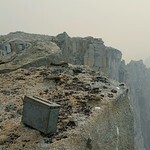 The blocky summit of Mt. Goode. 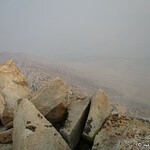 Unfortunately, smoke from forest fires obscured our views. Photo by Nathan Petrosian. 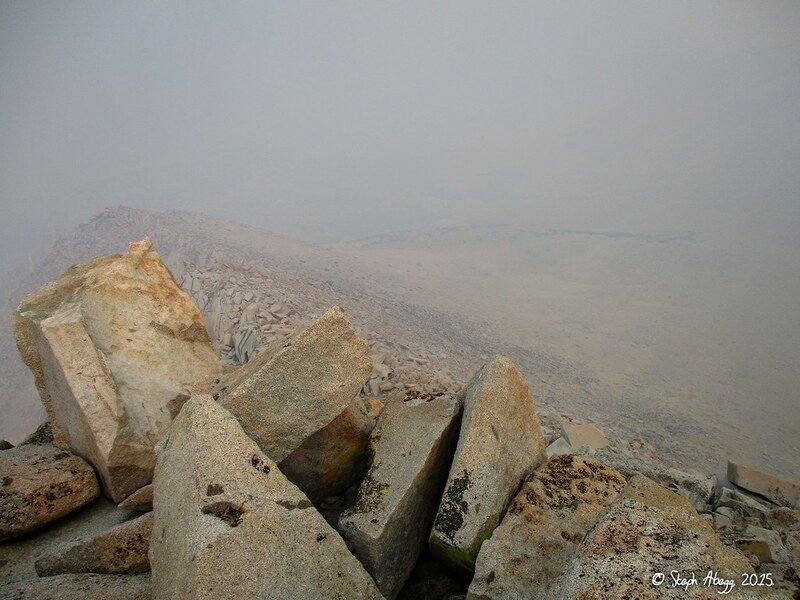 The descent is 5.5 miles (1.5 miles cross country and 4 miles on trail). Drop down southeast, following talus and then sandy trail, aiming for the land bridge between Saddlerock and Bishop Lakes which takes you to the trail. 26. Looking down the descent, which is about as mellow as descents come. 27. Lake afternoon sun over Goode on the hike out. 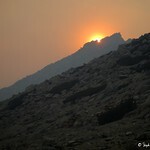 The colors are due to the smoke from forest fires. It was actually still a couple of hours away from sunset at this point.